Luxury Vinyl is the latest and greatest word in good looking, long lasting easy care flooring. This ultra-durable flooring has been a trade secret for years and is widely used in commercial buildings like offices, stores and care facilities – and now you can have it at home! 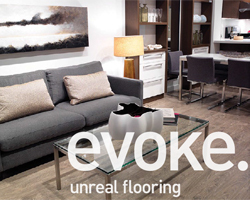 Evoke Luxury Vinyl is true, genuine 100% vinyl – not a composite or hybrid product like many others on the market. It offers three installation options, value priced and premium product choices, and dozens of beautiful wood-themed colors and textures. They can be installed anywhere inside the home – including wet rooms like laundry and bathrooms – over just about any kind of subfloor material.